Folk has already been represented on this site’s What Else Is Out There? section with The Offbeat, but today, it’s time to give props to a bit of Brewtown folk with a lot of members both past and present! As luck would have it, it’s Green Fortune. Mark Knight (mandola, lead vocals), Kay Knight (percussion, backing vocals), Rhys Jones (Harmonica), Carl Sutton (Guitar), Andy Faint (percussion), Stiv Hogg (bass) and Rhys Knight (occasional percussion or bass) make up this Midlands folk collective who have been described as a band that John Peel would have loved! 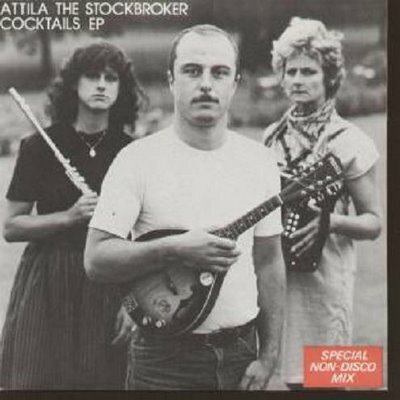 Though they have not been featured on Radio 1 by John Peel (they formed after he died but still), they still have gained a modest Midlands following and have added some much needed folk variety to the Brewtown scene…besides the Wurzels! Oh they’re not from round ‘ere, but they left their mark…on my poor eyes! The leader Mark Knight, like Scott Milligan of Kitten Pyramid, always had been into music since childhood and had grown up listening to Johnny Cash, The Rolling Stones and David Bowie who were modern day legends back then. How times change and the nostalgia whores weep! His first experiences with bands grew mostly out of his love for punk music in the 70s and 80s such as with beyond obscure bands like Filth and Mad Dogs (who I WON’T be doing pieces on, research would take forever!) and also joined The Gift with fellow veteran Midlands musician Bruno Gallone in 1985. After a few outings in the 90s with bands like Rezist and Digweed, Mark bought a slightly contrasting instrument to his punk years in 2005; his trusty mandola which he plays in GF to this day. Though it’s not THAT uncommon for the mandola and punk to go together. It wasn’t until 2007 that the idea of Green Fortune came to the heads of both Knight and childhood friend Jude Hackett during a drunk curry night out because hey, they weren’t getting older and they had nothing to lose but their dignity, which let’s be honest, is entirely overrated. Isn’t that right Kanye? 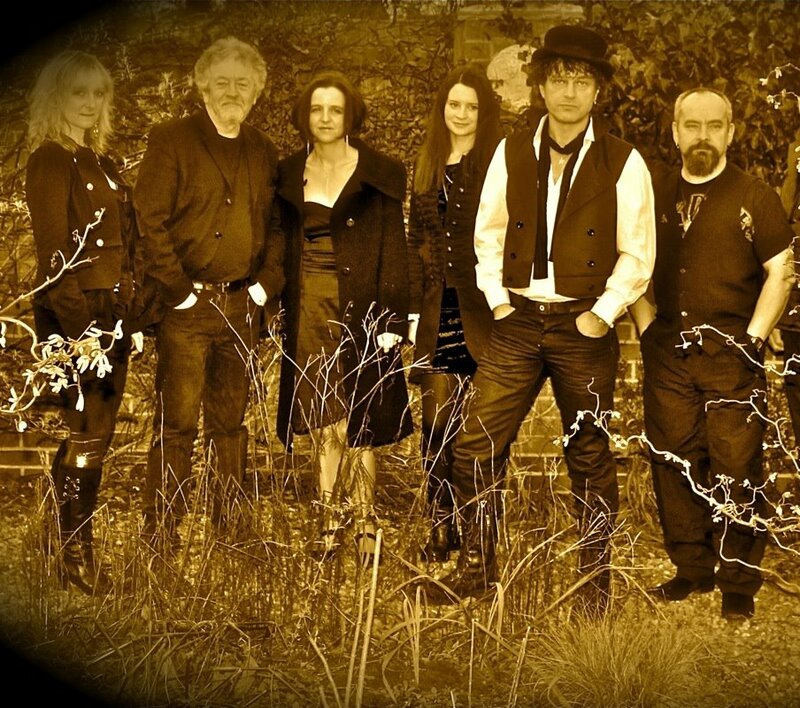 The yellowish-blueish gamblers were officially formed in the summer of 2008 with the original line-up of Mr and Mrs Knight, Hackett (bass), Sarah Devine (vocals) and Scud Stevens (percussion). Hackett and Mr Knight started writing music before adding these new members to the line-up which would be changing quite a bit over the next five years. Not to Iron Butterfly levels but they’ve had a fair few members. Plus their songs aren’t 17 minutes long either so this is the mootest of moot points! After beginning to rehearse both at home and in Moira along with the first couple of live shows (one with a bar patron expecting Metallica and getting Fleetwood Mac from them, supposedly! 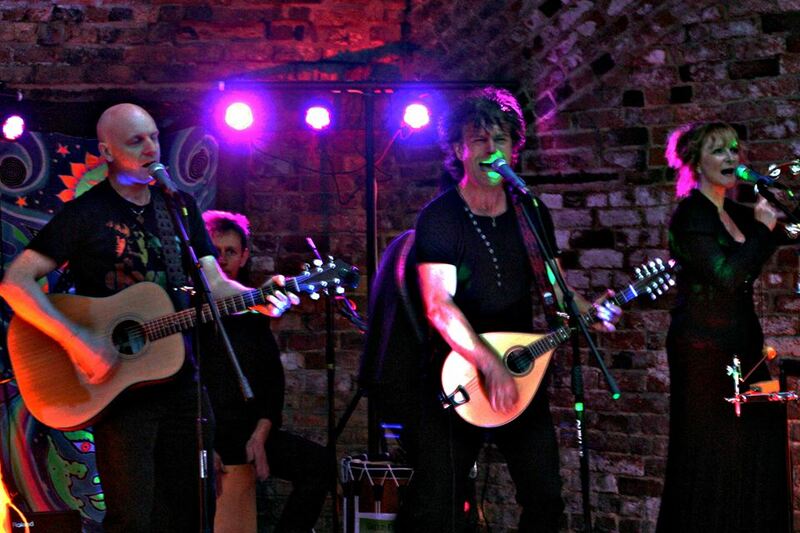 ), GF showed that folk had a place amongst it’s heavier rock contemporaries in the Midlands music scene. In 2009, they requested the help of Burton College to set up some sessions for their first set of tunes such as The Rose, Running in Circles and Permanence in Change to be recorded and stored on Myspace (ah those were the days…) and Reverbnation for all to see. Although they were an originals band first and foremost, which is good since I mainly cover those here (COVER ORIGINAL bands? Aren’t I confusing? ), they did do a folkified cover of the Buzzcocks most famous hit Ever Fallen In Love which later had a video directed by Derby-based film-maker Adam Stevenson. Despite Hackett leaving in 2009, the line-up soon became larger the next year when stand-up bass player Louise Hughes replaced Hackett, violinist Joy Gravestock and harmonica player Rhys Jones joined the fray also with Jones playing on the same bill as GF one night. Faint also replaced Stevens later on in the year. Music-wise in 2010, GF released their first single which was My Daemon Lover/Gypsy’s Curse, the former of which also had a music video directed by Adam Stevenson. A big highlight for them was to play at the Midlands’ largest creative arts festival Bearded Theory supporting The Wonder Stuff and Doctor and the Medics. 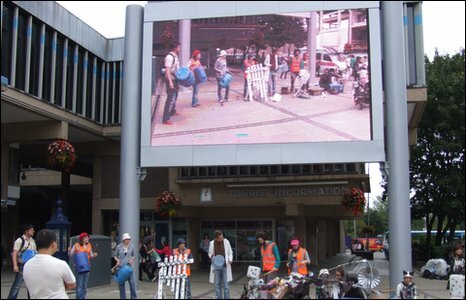 With 2011 came new members such as guitarist Carl Sutton and percussionist Andy Faint with the departure of Devine and Stevens and news delivered to them in April that the video for My Daemon Lover would be played on the BBC Big Screens in both Leicester and Derby! In May, they had their first radio interview with Ashby-based community station Hermitage FM and they took part in the Ashby Arts Festival to coincide with the interview. To round off the year, the band released their second dual single Ever Fallen in Love/ On Icarus Wings on iTunes like they had done with their previous single and would do with their third dual single in 2012 Empty Skies/ Where Do I Begin? Also in 2012, they joined the likes of Scott Milligan and Star From Ivy to start the Arch Creations Revolution to help build more interest in the Brewtown scene in the run-up to Burtfest. 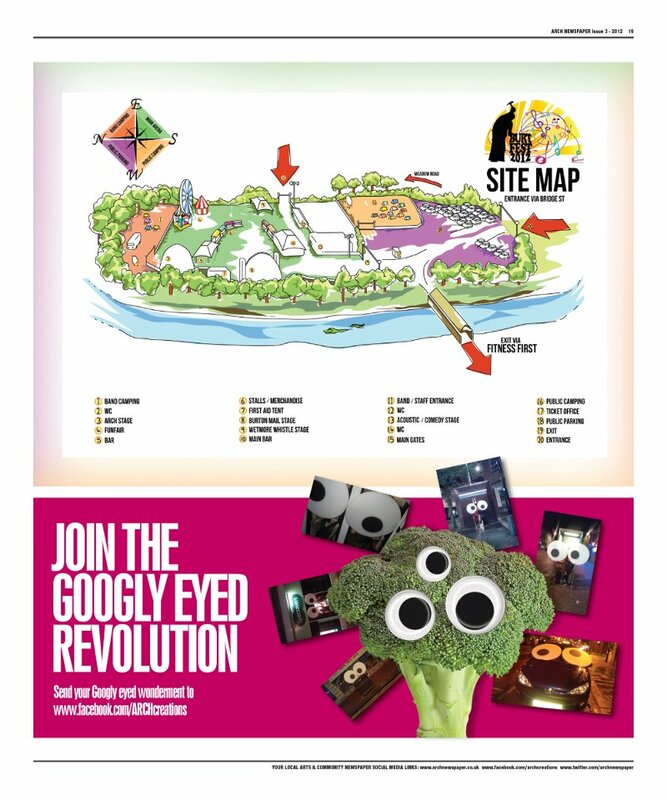 When you think revolution, you think googly-eyed broccoli. Guevara be damned! Though they were not on the card for Burtfest, they were on the card for the first Gladefest taking place at Rosliston Forestry Centre at the end of August alongside the Roz Bruce Infusion and The Offbeat. It was also the last gig for Hughes who was replaced by Mark’s son Rhys Knight who you may know from Mario’s Nicotine Parlour and debuted with the band at the Moira Folk Furnace Festival. In November, they had a big support spot for a gig headlined by Derby folk musician and BBC Horizon award winner Lucy Ward at the Snibston Discovery Museum. She has a Wikipedia article with a decent amount of information so that’s nice. Not Icarus’ Wings but it’s close! As 2013 rolled round, the position of bassist was batted around from person to person including Rhys Knight, Leicester-based bassist Mark Kinton, formerly of Three Legged Dog, Burton music promoter and former Star and Garter pub owner Paul ‘Lavy’ Latham and former Deadtime Philarmonic bassist Stiv Hogg. Rhys Knight also would deputise on percussion when Faint was unavailable such as at 2013’s Moira Furnace Festival and Gladefest II which had support from Tilted Smile and The March, a band they would later support at the Wetmore Whistle in September. But in October was when they had a true triumph! How so? 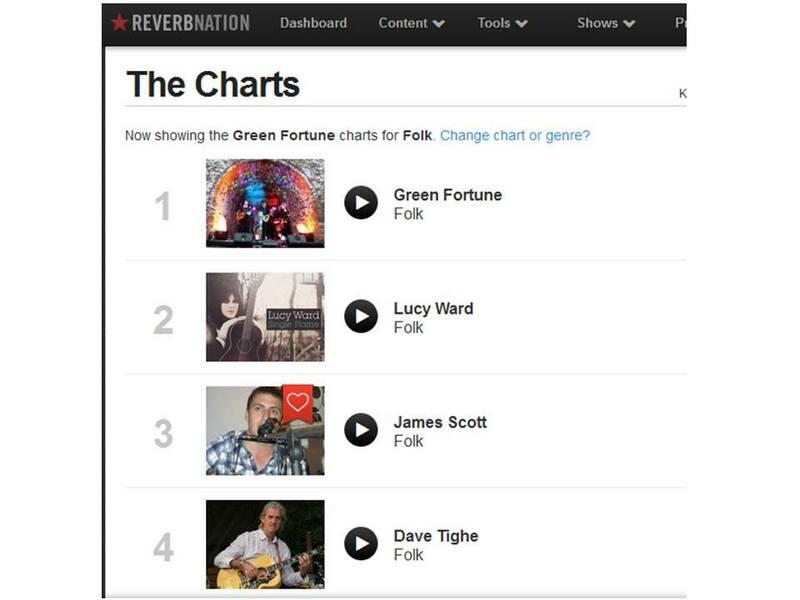 After a number of months of leaping into the Top 10 of the Midlands Folk charts on Reverbnation, they finally achieved No1 status, even beating out Lucy Ward! So who supports who now then, hmmm? It’s like being top of the Conference North division, but still, it’s a victory! So music-wise, how do the Overseal gypsy band fare? Well this is the other side of the folk spectrum compared to The Offbeat. Whereas that band is innocent and bouncy, Green Fortune is more raunchy and gritty with the punk influences and mature subject matter. Each band member provides and past members have provided a layer of great importance. Not even the bells provided by Kay Knight feel insignificant alongside the bass of Hughes or the mandola of Mark Knight. Their music is both enjoyable and enchanting to listen to. Their songs can range from being about gothic romance (My Daemon Lover) to a rousing sing-along (The Seventh Magpie) all done in the style of a traditional folk band with a punk edge to them along with very interesting arrangements of old punk classics such as the before mentioned Ever Fallen In Love and the Stranglers’ hit Golden Brown. The vocals go back and forth between Devine and Mark Knight with both providing their own vocal strengths with Knight’s being more rough and worried and Devine’s being more calm and conniving. The second song Empty Skies however, is much calmer and beautiful sounding with the violin, harmonica and mandola featuring prominently throughout. Knight’s vocals are softer this time around and have a more emotional weight here and are the main vocals in the song. It’s a song that tries to seek out the clarity much needed in life’s journey that could only be seen through an un-clouded ’empty sky’. Not to be confused with the Elton John album or 2011 film though! It’s a great demonstration of their soft-spoken side that goes well alongside their more upbeat and energetic songs that provide a good variety to their catalogue. As always, check for yourself if you don’t believe me! Summarising, Green Fortune provide some good folk variety like Great Scott provide good hip hop variety to a predominantly electric rock scene. Their lyrics tell an interesting tale and their music provides an entertaining backdrop. Highly recommended for lovers of the Pogues and The Levellers. As always, this has been Brewtown Music serving you another fine brew of Midlands tunes.